The new Xcode 9.1 beta has also been released by Apple today with support for the new operating system updates: iOS 11.1, watchOS 4.1 and tvOS 11.1. It also includes a more fully-fledged iPhone X simulator, which demonstrates the new lock screen and home screen experiences. Whilst the simulator OS was in a bit of a weird shape in Xcode 9, the Xcode 9.1 iPhone X simulator much more closely reflects what iOS will look like on the new edge-to-edge rounded screen. This gives us our first close-up look at the home screen and lock screen experience for iPhone X. On the home screen, Apple ditches the attached appearance for the Dock with a new iPad-like design that follows the rounded corners of the physical screen. Unlike the iPad, the Dock is limited to a total of four apps, the same as the standard iPhone. The lock screen has more major components to look at, including a couple details that weren’t present at Apple’s September event. For starters, the iconic hint text now reads ‘Swipe up to open’. The home indicator, the persistent thin bar at the bottom of the screen, also gently animates up and down to further suggest to users how they should unlock and interact with an iPhone without a physical home button. You can see the grayed out camera shortcut here too; as this is a simulator it doesn’t connect to an actual camera so the icon is in the disabled state. On a real iPhone X, there will also be a flashlight shortcut on the left side of the screen. Users press firmly (3D Touch) on these buttons to activate them. If you also look at the top right of the screen, in the right ear, you can also see a mini Control Center icon paired with another pull-down indicator. This is another interface hint for how users find Control Center on the iPhone X; by pulling down on the right side of the status bar. 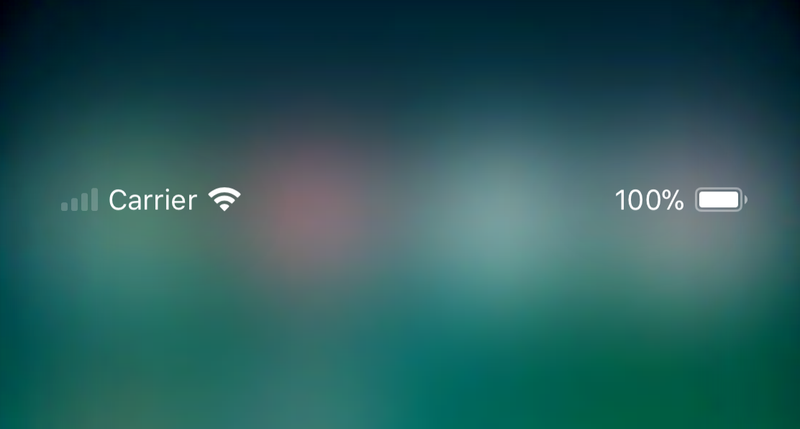 On the simulator, the Control Center interface doesn’t actually work but you can see how the status bar disappears and a new row of status items appears below the notch area. This includes the carrier name and battery percentage. Guilherme Rambo has also uncovered a series of onboarding videos that Apple will show new iPhone X users to introduce them to the various new interaction metaphors, from the swipe gestures to the new side button actions.